Your jewelry and golf collections are unique. They are not only an expression of personal style, but ultimately help define who you are. Each piece deserves to be maintained at its best. Our mission is to make it simple, easy, and convenient to make your entire collection sparkle. It takes only a few minutes to make your whole collection glow. The Collé Collection of products are the first of its kind. Out with old liquids, dips, and sprays. In with a new luxury mousse. All Collé products are sourced from eco-friendly distributors, are non-toxic, and all packaging is 100% recyclable. 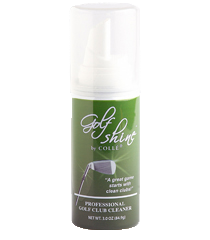 Golf Shine is a cleaning mousse that is easy to use and helps remove dirt from your clubs that can negatively affect their performance. The grooves on the club face add spin to the shot and dirt on the face can transfer to the ball, both affecting the distance and accuracy of your shot. 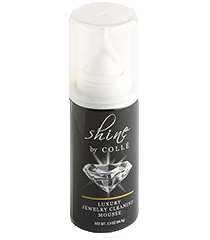 Get Shine Jewelry Cleaner Now! Cleaning mousse for golf clubs. Give the gift of Collé. Get a Gift Set Now!